Björn: . . . .
You’re group? You’re kidding? Or is it your age? Agnetha: . . . .
Benny: . . . . Lyrics reproduced with permission of POLAR MUSIC INTERNATIONAL AB. Used for fan club purposes only and must not be reproduced in part or whole without the express consent of the owner. All photographs are used for official Fan Club purposes only. Used with the authorisation of ABBA and management. The ® logo is a registered trade mark of Polar Music Int. AB. and is used with full authorisation by this service. All photograph's copyright controlled by the owner and Polar Music Int. AB. 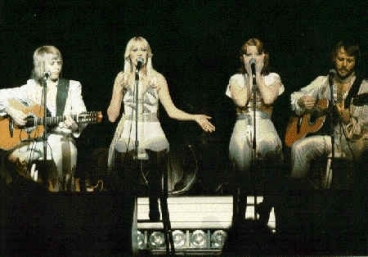 After ABBA Magazine® and The Official Australian ABBA Fan Club® are registered trademarks of ABBart Productions AB. All articles remain property of NFP International AB, and must not be reproduced in part or whole without the express consent of the owner. ABBart productions do not take responsibility for any inaccurate information supplied from independent sources.